j) Spending several months in a flashback. 3. 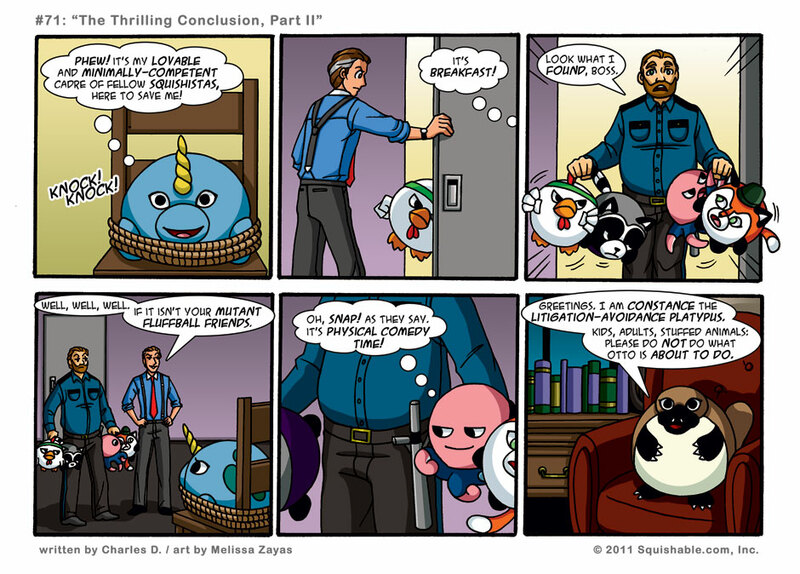 The portrayal in this webcomic of walking, talking, sarcastic stuffed animals does not in any way constitute an offer for sale of walking, talking, sarcastic stuffed animals by Fuzzy Five Industries, Inc., Squishable.com, Inc., The Oklahoma Department of Tumbleweed Control or any other entity, real, imagined and/or of disputed existence. 4. If your stuffed animal starts talking to you, get mental health help immidiately. 5. Printouts of Fuzzy Five comics may be flammable or may have sharp edges. HAHAHAHAH. I love the angry chicken pose. my insurance won’t pay for mental health services. oh wait. i don’t have insurance. nmind. and what IS OTTO going to do?? ARe you REALLY going to make me wait a WHOLE WEEK?? ?